The classic enzyme cascade composed of glucose oxidase and horseradish peroxidase exhibits more complicated dynamic behaviors than previously thought. The construction of enzymatic reaction networks in vitro with programmable and predictable dynamics is an emerging topic in synthetic and systems biology, and will enable new developments in biocomputing, biorobotics, and biomanufacturing. As we place different enzymes in unnatural scenarios, many unknown reactions and interactions will emerge, leading to both challenges and exciting discoveries. The glucose oxidase (GOx) and horseradish peroxidase (HRP) cascade is one of the simplest model systems for enzyme cascades and has been extensively studied. When using ABTS as a colorimetric substrate, the currently known cascade reactions are that GOx utilizes O2 to oxidize glucose and produces H2O2, which is then utilized by HRP to oxidize ABTS to its radical cationic form, ABTS+•. We studied this system when we were trying to determine the origin of the activity enhancements that were frequently observed in enzyme cascades on DNA origami scaffolds. By carefully characterizing the reaction kinetics of the free enzyme cascade and the GOx-HRP conjugate, we confirmed that proximity itself was unable to increase the activity of a cascade. Instead, the charges on the scaffolds modify the microenvironmental pH, which leads to an acceleration of the enzymatic reactions. (Nature Communications 2016, 7, 13982). In order to simplify the discussion in that paper, we kept the GOx-catalyzed reaction at a slow and constant rate. We then asked what the complete kinetic description of this cascade is. We carried out the cascade enzymatic reactions in a sealed quartz cuvette with a light path of 2 mm, which enabled us to monitor the whole reaction process and quantify the oxygen consumption. Surprisingly, we found that the solution became green initially but then turned colorless over time. Further investigation convinced us that there was a new reaction where GOx takes ABTS+• as an alternative substrate to oxidize glucose. This reaction has been overlooked by researchers for more than 40 years. More generally, this reaction occurs between flavin enzymes and ABTS+•. Taking advantage of this newly discovered reaction, we can easily create multiple pulse responses including charging/discharging, rectangular, and parabolic pulses. All these responses are based on the self-governing substrate competition without relying on any external stimulus or activation/inhibition interactions. We also demonstrated a green bottle experiment, an enzymatic version of the blue bottle experiment, in which the solution toggled between green and colorless. This green bottle experiment avoids using strongly alkaline reagents, and the reactions are greener, faster and more controllable. We hope it can replace the classic version of the demonstrative experiment in chemical education for K-12 students. This simple reaction network can not only demonstrate chemical dynamics, but also hydrodynamics. It can display visible spatiotemporal patterns from Rayleigh-Bénard convection in a petri dish when the system is exposed to air. 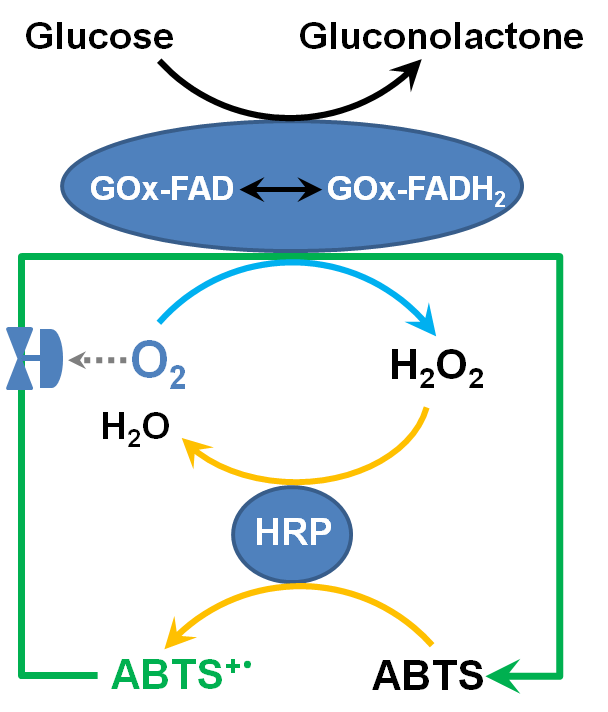 The convection is driven by the GOx-catalyzed reaction and visualized by the HRP-catalyzed reaction. Typical Rayleigh-Bénard patterns including dots, polygonal cells, concentric rings, and stripes are created by this reaction network. A video below shows the emergence of maze-like patterns. It is fascinating that such a simple enzymatic network can generate so many intriguing dynamic behaviors. Giving the abundance of available building blocks, we imagine that many discoveries can still be made when constructing more enzymatic reaction networks. More details and movies can be found here.